Before I begin, check out my monthly post on Hometown Pasadena! Tomorrow my youngest child turns six. Of course he’s all excited about getting older (OK, yes, and getting presents.) For whatever reason, I always get a little teary the day before my children celebrate another year of life. My mind drifts back to what I was doing the day before they were born. In Grayson’s case, with a scheduled C-section, six years ago today, I knew it was the last day of my pregnancy. With a one-year-old and two-year-old at home with me (I know, right? ), being a 38 year-old pregnant woman with a 10 lb. baby in my belly I was mostly focused on gettin’ that kid out. FAST. I seem to recall a tearful checkup with my OB where I pretty much begged him to move up my delivery date by a week as I just didn’t think I would make it to the finish line. He didn’t. I did. The aching back, insomnia, swollen feet and baby shoved so far up my rib cage I couldn’t bend forward to even wash the dishes by this point… all those memories have dissipated by now. Mostly now I think back and realize that six years ago today I was pregnant for the last time in my life. I felt then and still do feel so incredibly lucky to have carried three amazing little people in my belly. From the first to the third I marveled at them from the moment I looked into their brand new eyes. I kept them in the hospital room with me and despite exhaustion and the opportunity to rest before returning home, even with my not-so-little guy I held him and gazed at him constantly. Just couldn’t get over the miracle of the whole thing. Still can’t, really. Tomorrow I’ll be awakened early–I know it–by an eager kindergartener who can’t wait a moment longer to open his gifts. But today I will sip my coffee for just one extra minute and bask in these quiet memories. Directions: Put bread aside. Mix everything else together. Dip bread into mixture and cook on griddle. 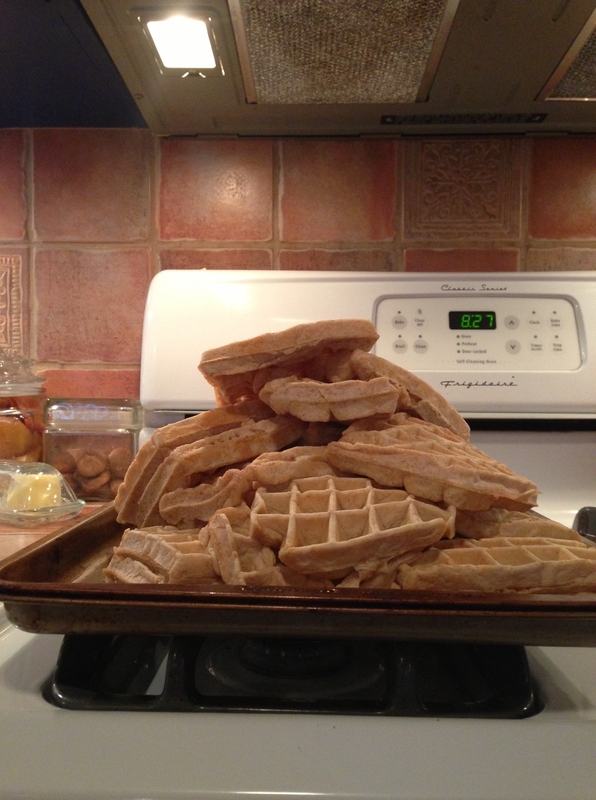 Serve with butter and real maple syrup whenever possible. 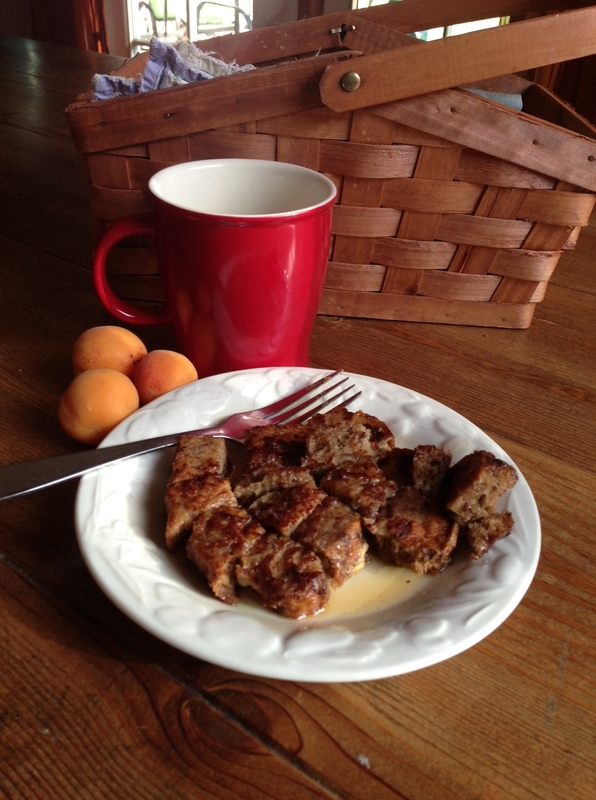 Tip: I often make this recipe with a dozen eggs and an entire loaf of bread. Freezes great, pop it in the toaster and wah-lah! 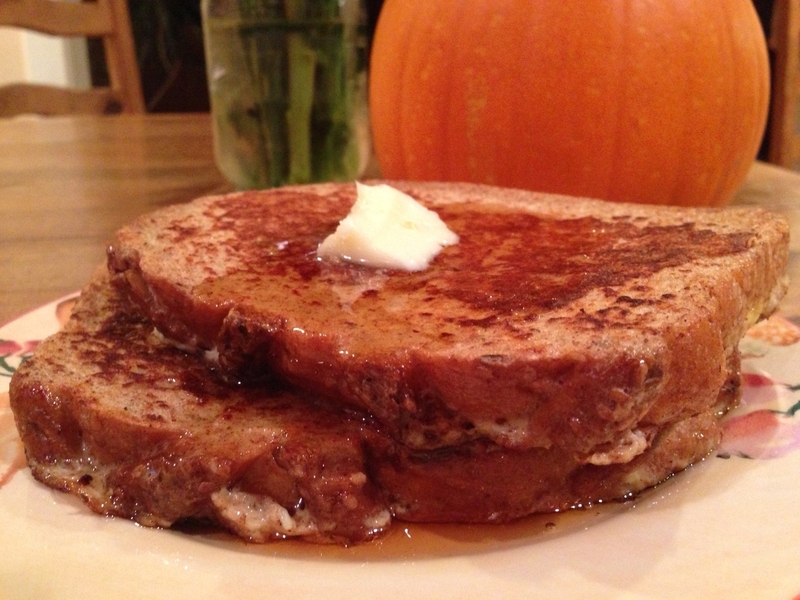 French toast any time you want. Life contemplation is optional. My continuous search for even more easy-tasty-healthy breakfast continues–and does this look like the next cover of Sunset Magazine or what? So, our Saturday pancake adventure began because of a new friend who is looking for a more protein packed pancake. I remembered a recipe my girlfriend, Shandy (don’t you just love that name? ), had given me and decided to give it a whirl. Directions: Beat eggs and cottage cheese with an electric mixer until almost smooth. Add every else, mix, pour onto hot griddle and I hope you can take it from here. Verdict: All five of us loved these pancakes! They have an “eggier” taste than my regular cakes, kind of along the lines of a crepe. I didn’t take a photo because they didn’t really look any different from any other pancakes. What I did take a photo of, though, is the other pancake tangent we took Saturday morning. I had three bowls of pancake mix going at one point and one of them turned into the fab photo you see today: Pina-colada Pancakes! Basically I took my regular buttermilk recipe and, after pouring onto the griddle, added a few pieces of drained pineapple and a few pinches of sweetened coconut. I had to cook the pancakes on a very low heat as the pineapple’s moisture would make them doughy. I may try just mixing some crushed pineapple into the mix next time but in terms of presentation, I love the way the griddle seared the pineapple and coconut when the cakes were flipped. 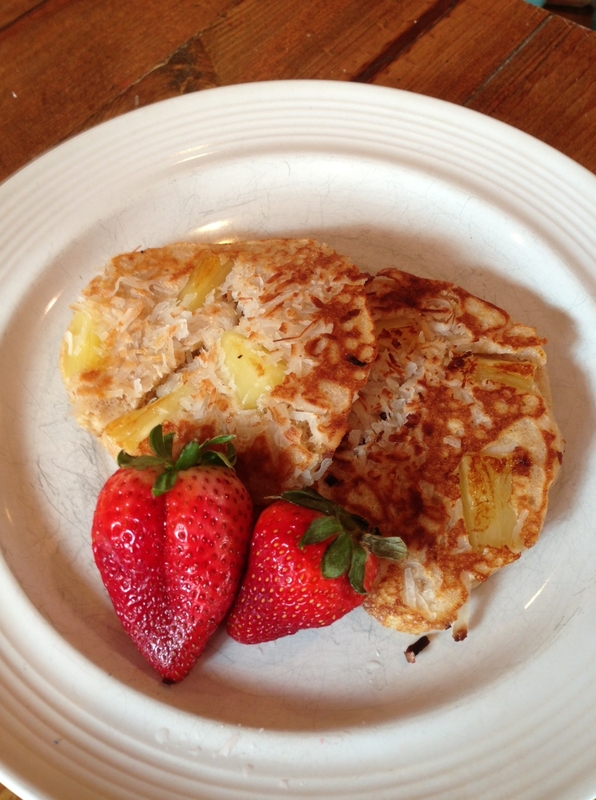 My oldest daughter proclaimed the pina-colada cakes “the best pancakes ever.” Although only nine, she has likely tried more homemade pancakes than many adults alive today, so, you know, it’s a decent referral. Notes/tips: This mix should be thick, but still pour. Sometimes I add a dash of milk to thin it. Cook pancakes on a med. heat to cook through middle too. 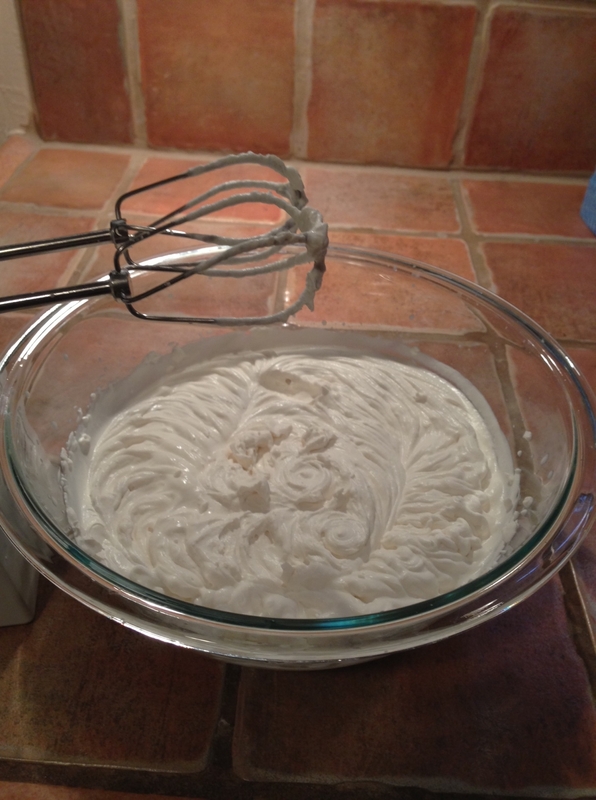 This is whipped cream. I make mine with a few teaspoons of sugar and a little glug of vanilla. I suppose, technically, there is calcium in whipped cream, but anyone who’s eating something like this for its nutritional value is really grasping at straws. 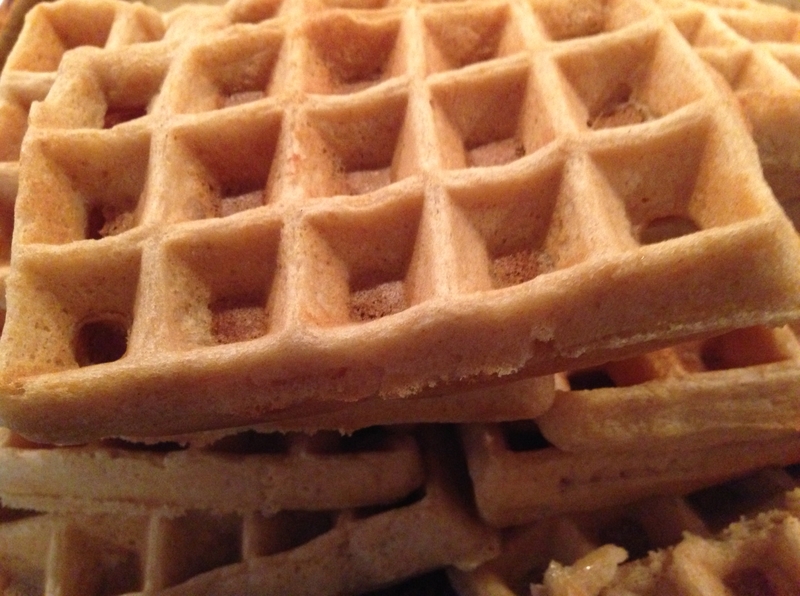 At our house we eat it (on waffles this morning) for the smile factor. That’s a good reason to eat whipped cream. Fruits and Vegetables. We should all be eating more fruits and vegetables. I’m assuming this sounds familiar to pretty much everyone reading this blog–if not every person reading any blog. 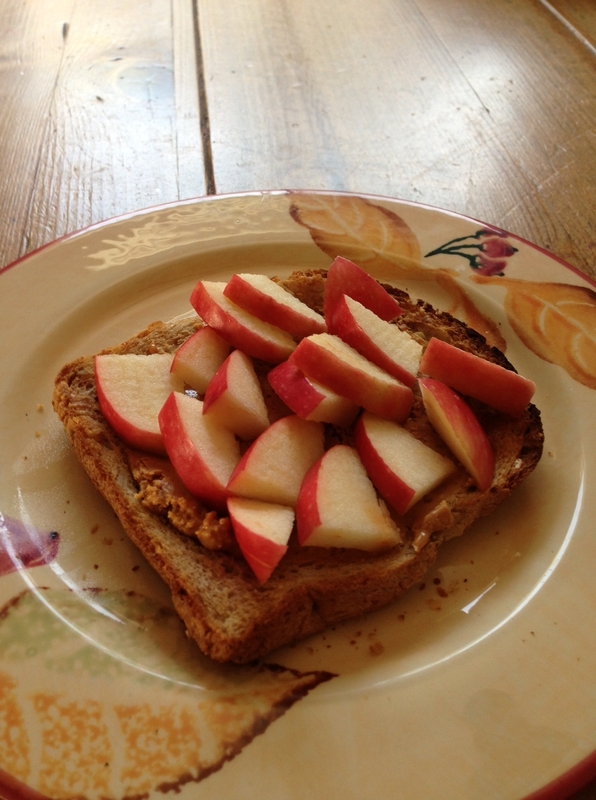 In season right now at my local farmer’s market are Bosc pears that we are totally diggin’ at my house. Their brown skins make them an exotic addition to the fruit bowl. Here in sunny southern California even these kiwis are locally grown. You can get oranges at the farmers market too, but I don’t have to because my mom/neighbor has a tree with prolific amounts of delicious oranges. Lucky us! Because I’m a time economizer, I’ve developed the format you see pictured above. Step 1: Mommy cuts fruit on cutting board. Step 2: Cutting board is placed on table for mass consumption. Step 3: Three kids and husband have at it. 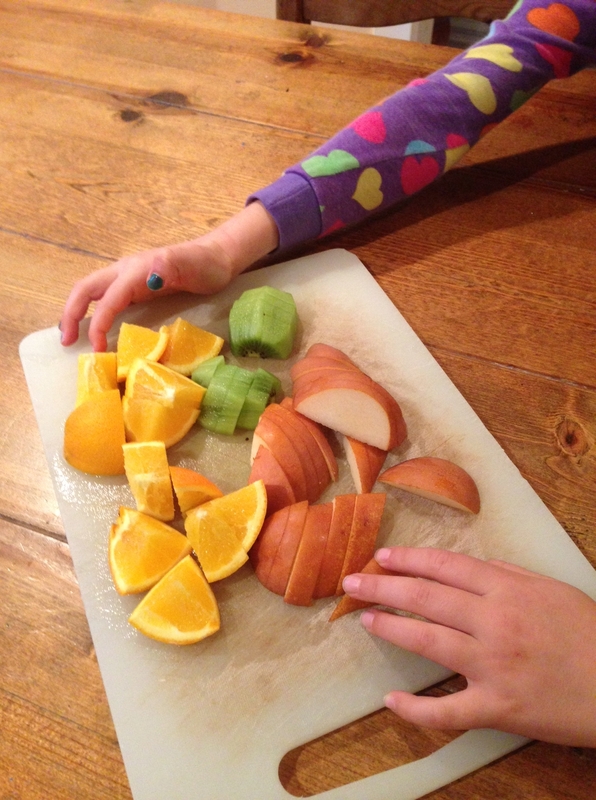 Step 4: Mommy–or sometimes Daddy :)–clean up said cutting board. My two girls volunteered as hand models in the photo above–they were so excited to “show everyone how we do it at our house.” I tried to get a shot that didn’t include the atrocious blue nail polish you see (thanks, Catalina, for the birthday party nail salon!) but couldn’t. But then I figured hey, this isn’t the Pottery Barn catalog. Blue nails and all, here we are eating breakfast at my house. Have a great day! Oatmeal. At our house we love a good bowl of oatmeal. I shall emphasize the “good” in that sentence, as it is crucial to the positive oatmeal experience. I like pretty much all foods that enter my mouth to varied in texture, a bit complex and bursting with flavor. 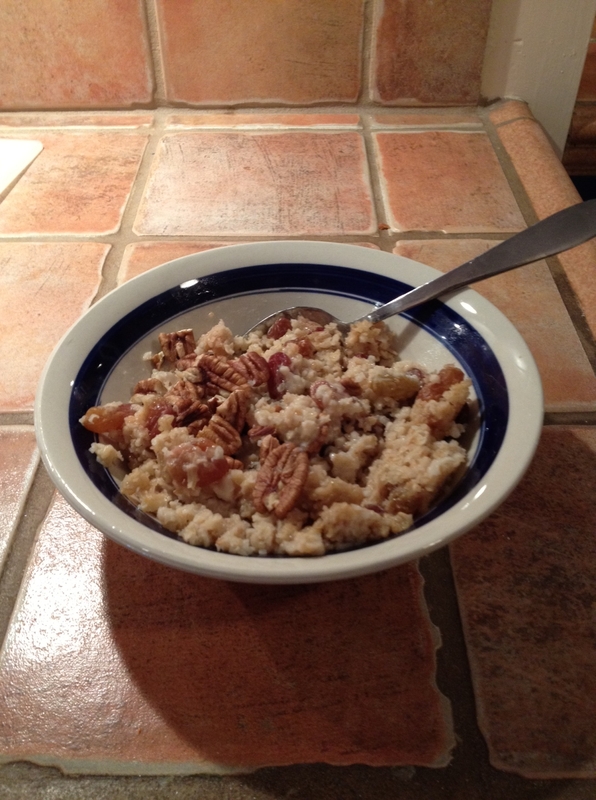 The lovely portrait of oats you see pictured above is “Coaches Oats” with brown sugar, raisins, walnuts and pecans. Splash some milk on top and gimme-some’a-that! I have some old-fashioned Quaker oats in my pantry (it’s on the bottom shelf so you couldn’t see it on the “heart” photo post the other day) but these are reserved for baking. Sorry Mr. Quaker guy, but your oats just don’t cut it in a bowl ’round here. I discovered steel-cut oats (small can) several years ago and I must say, they changed my oatmeal outlook big time. Steel cut oats have a nutty, textured taste. They can take up to 45 minutes to cook though, so, you know, ya gotta have a good plan in place. Whenever I make them, I make up a pretty big pot so we can have them for a few days. Sometimes, when I’m feeling really crazy, I even freeze them for a future defrost. I know. Now that’s crazy. 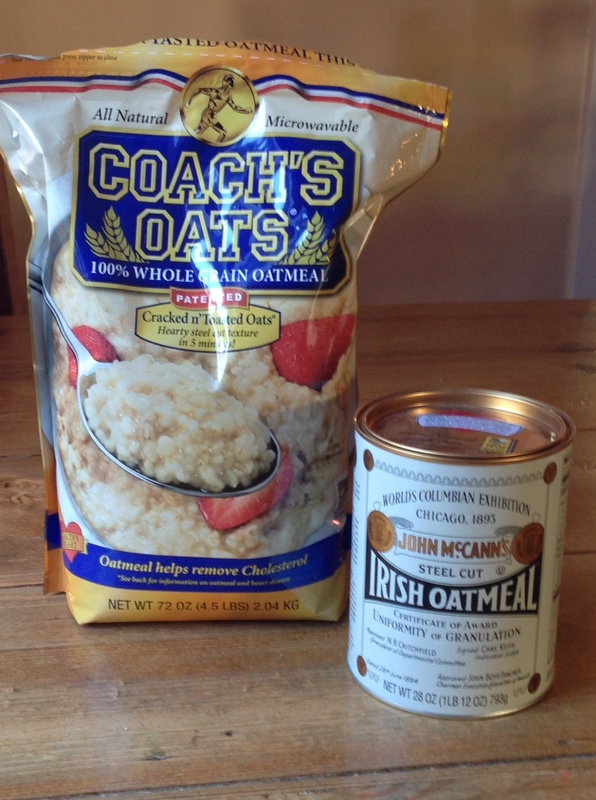 More recently I stumbled upon “Coaches Oats” which is a whole grain oatmeal I’m able to pick up at Costco. These little honeys cook up right-quick and have almost the same nutty-ish taste and fuller texture that my peeps know and love in their morning bowl. I’m not trying to plug any brands here, but I do recommend a whole grain oat if you’re going to make anything at all. “Whole grain” means that the hull–which contains all the fiber and most of the nutrients–has not been removed from the grain. My husband likes his oatmeal with raisins, brown sugar and a spoonful of natural peanut butter mixed in. I don’t know if feeding this concoction to your husband will make him as dashingly good-looking as mine is, but you could try and let me know.